Our new $10 gourmet cookie dough fundraiser will bring you even greater success.This cookie dough fundraiser features 6 of our best selling flavors, offered in a 2lb tub format, at only $10 each. As a bonus, it also offers one $16 super size box of 40 preportioned chocolate chunk cookies which means your group will make even more profit! Are you ready to bring your $10 cookie dough fundraiser to the next level? FREE to Start: The $10 Crazy About Cookie Dough fundraising program costs absolutely nothing to get started. Simply let us know how many fundraising participants you have and we’ll send 1 order-taker for each of them, at no charge. Reach Your Fundraising Goal: Your profit varies from 30% up to 55%! Smaller groups can aim to sell at least 336 tubs, which is at the 40% profit level, for earnings of over $1,300 profit. Larger groups can aim for the 55% mark. Free Shipping and Low Minimums: Your group receives free shipping when you sell 150 items or more. This is easily attainable by even a small group of 15 participants (only 10 items each). The minimum order is only 84 items! How Does the $10 Cookie Dough Plus Fundraiser Work? 1. 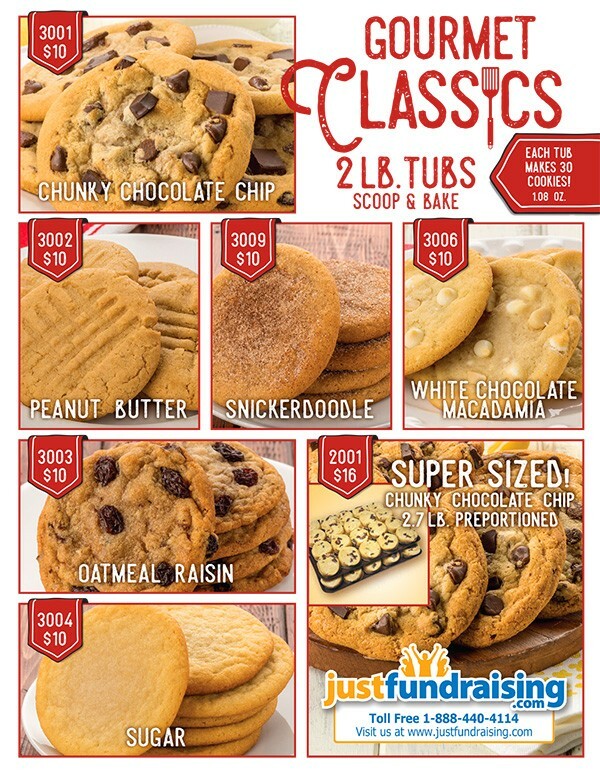 Order 1 $10 Cookie Dough order-taker PER fundraising participant – they’re FREE of charge! Our graduation class raised over $2,000 profit for caps and gowns! Our Basketball League raised over $2,000 profit to help pay for registration and uniforms. Our boys 'n girls track team raised over $1,600 profit for new warm-up uniforms. We hadn't done this type of fundraiser for a couple years but we were very happy with the results. We definitely plan to do it again! We only have 57 students at our school yet we managed to raise over $2,000 profit for new toys and mats for playing. This was our first time using you guys and we are very happy with the results! This fundraiser went ever better than we expected. Our group raised over $1,600 profit to help pay for new playground equipment. Our Jr. High School's "Care to Learn" program raised over $1,600 profit! We raised over $2,000 for our annual Christmas party! Our school raised over $2,000 profit with only 2 weeks of selling! We were raising funds new playground equipment. The new equipment alone was all the motivation the kids needed, but we also offered gift cards to the best sellers. We just raised $2,200 profit selling your cookie dough. It was really easy! Our girls are headed to the Nationals in Vegas and we need the money for registration, hotel fees and other expenses. Our boy scout troop wanted to try something new instead of our usual popcorn and Christmas wreath sales so we decided to try selling cookie dough. It went great and we will definitely be doing it again next year. We only had 25 scouts, but we raised over $3,500 profit which will help pay for events and other things. Oh my gosh. I was shocked. We sold 258 tubs of cookie dough! I did not anticipate so much participation from our small group of 20 home schoolers. This was a great first time fundraising experience. Thanks so much! We will be ding it again next year. Our school had a very successful fundraiser. We ended up raising over $2,800 profit which will go towards our after school programs. We recently lost the grant to fund our after school programs. So the money raised will allow us to still offer the programs free of charge to our students. I was kind of shocked with our results. I wasn't expecting to do this well. We sold $7,000 of cookie dough tubs and earned more profit than we did with previous coupon books and shopper fundraisers. 24 of our 32 Cub Scouts sold your gourmet cookie dough and managed to sell 528 tubs, netting $2198. The funds are going towards camp-out and the Pinewood Derby Workshop next summer. We found it to be a real easy fundraiser! Our math club raised over $800 profit which will help pay for contests and field trips. The $10 price, and fact that the cookie dough can be stored at room temperature makes this fundraiser very simple and easy. This is the second year in a row that we have used this fundraiser and it's always so easy. Our customers don't think twice abut purchasing a tub since the price is so low. They funds we raised will help pay for a spaghetti dinner that we host at a local country club, we'll be feeding about 200 people! We had a small group of only 12 sellers and we were raising money for local kids to get them Christmas presents and take them on school trips. We were very pleasantly surprised with the outcome of our fundraiser. We're a small school with only 250 students and only about 20% actually participated in the fundraiser. We ended up raising over $4,500 in profit which will help pays for individual students classes, field trips and many other things. We raised $1800 doing the cookie dough fundraiser. We were only 11 sellers and profited over $700. The $10 buckets were an easy sell, it was a good price point which people could afford. Definitely doing this fundraiser again. Our football team raised over $1,700 profit to help pay for our out of town tournaments, hotel costs etc. 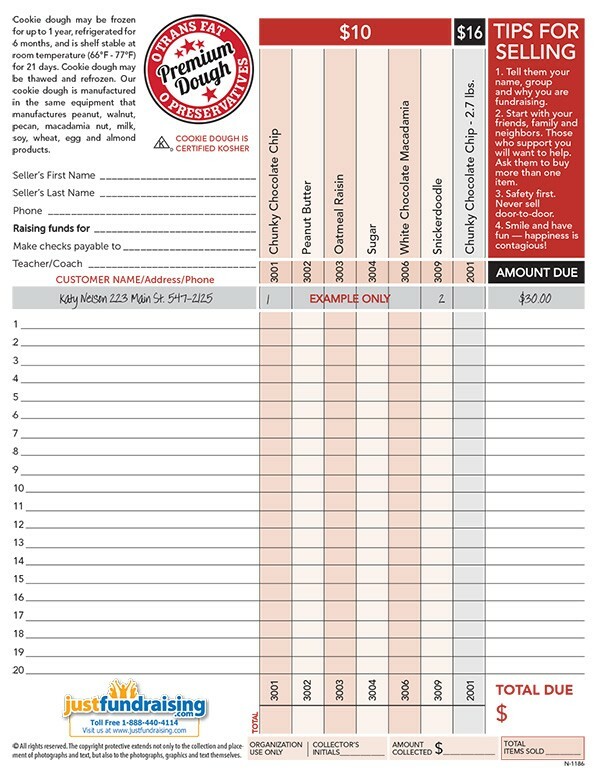 Our Booster Club/PTA group used this fundraiser to raise money for different activities throughout the school year. We are very happy with the results, especially since we're a relatively small school. The whole process was very easy. Our group of 15 sellers raised over $1,400 profit for new uniforms and other accessories. We used the sample parent letter from the fundraising guide to send home with our group members and posted the fundraiser on our facebook pages. Our little league raised over $2,000 in profit! We had a group of 50 sellers and just gave them the forms and told them to get out and sell. The money raised will help pay for supplies, uniforms and anything else we need. We had alot of success with our cookie dough fundraiser. Our supporters we happy to purchase tubs since they hadn't seen a similar type of fundraiser in a while, and the low price made everything very easy to sell. We only had 12 sellers, but we ended up raising over $700 for our trip to Atlanta. Our fundraiser went even better than expected, our group raised over $2,000! All of the money raised will be donated to local charities. We had about 20 students that were raising money for prom payments and yearbook photos. Although the participation was a bit lower than expected, we still ended up raising over $400 in profit. some students sold as much as 30 tubs on their own. Our National Honor Society had a group of 65 sellers and we ended up raising almost $2,000 in profit! We asked each person to sell a minimum of 6 tubs. The profit will go towards community events like Christmas parties and different ceremonies. We also distribute scholarships to 2 members each year. We did this fundraiser last year and we will definitely do it again. Our dance team raised money that will help pay for registration fees at nationals. Everyone loves the cookie dough, I bought a few tubs myself and ate them up very quickly! Our Daycare raised over $3,000 with only 15 families participating in the fundraiser. All of the money raised will go towards a keypad for the entrance of our building. We were able to sell 100 tubs between just 2 of us. Our fundraiser went much better than expected. We only had about 10 sellers participate but we still managed to raise over $700 in profit which will help pay for students field trips. Our cheer squad had a group of 30 sellers that were raising money to go to camp. We asked each person to sell 10 or more tubs and we ended up raising over $2,000! We even had one group member that sold 83 tubs on their own. Our childcare facility runs this fundraiser every year. The money raised goes towards new cribs, craft supplies and other revamps. Rather than charging a fee to our customers, we use this fundraiser to cover the costs. We only had 16 sellers participate, but everyone was very motivated. Some families sold as much as 65 tubs! Our volleyball team of 27 girls just sold 524 tubs of cookie dough! They're thrilled because they'll all be getting new uniforms, and now we extra funds for camps and other fun stuff. Our football team sold cookie dough to raise money for travel expenses to go to the Turkey Bowl. Although only half of our group ended up participating, we had some very motivated sellers that went above and beyond what we expected. We offered prizes to the top 3 sellers. Our best seller sold over $700 worth of items, and the next best sold over $600! We are a division 1 school. Although, we only had 60 kids participate out of our entire school, our PTA still managed to earn over $3,300 profit in just over 2 weeks. Our football league used the cookie dough to raise money for new equipment for our new season. Our group of sellers were very motivated, we simply gave each member their order form and told them when it's due. Although not everyone ended up participating, we still raised over $2,900 in profit. Our band members sold the cookie dough to help pay for their fees. Although less than half of the group ended up participating, we still ended up raising over $1,400 in profit. Some members sold as much as 30 tubs! We raised over $600 in profit doing the cookie dough fundraiser. I did the fundraiser on my own, sold over 160 tubs using facebook. I posted the pictures of the individual tubs on facebook and people started ordering. This was the easiest fundraiser I’ve ever done, having pictures posted on facebook made all the difference. Our fundraiser went very well. We’re a softball league and we do a fundraiser every year to pay for equipment and other things. We only had 132 sellers participate this year, but we ended up raising over $8,000 in profit. We set a minimum of 10 tubs per person, we also offered prizes to anyone that sold 12 or more tubs. Each player was raising money for their own individual account so they were definitely motivated to sell! Our $10 cookie dough fundraiser was the easiest program we’ve ever sold. The product just sells itself. We used Facebook to promote and remind everybody to support us. We’re a small daycare of 20 kids and we sold over 250 tubs with little effort. Our fundraiser went very well, we ended up selling 100 more tubs than we did last year. We throw a huge holiday party every year, we are expecting close to 300 people this year and the money raised will go towards the expenses for our party. We raised over $500 with our Beta club with only 2 weeks of selling. Delivery was fast and everyone loves the cookie dough!